How to Share Folders on Amazon S3. 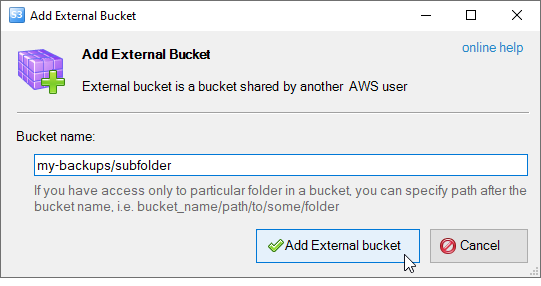 How to Grant Access to the Folder inside Amazon S3 Bucket. Folder Sharing on Amazon S3. How to Grant Access to the Folder. How to Share Buckets and Folders. Table of Contents. How to grant access to some folder inside the bucket. How to use Amazon S3 Bucket/Folder shared by another Amazon S3 user. 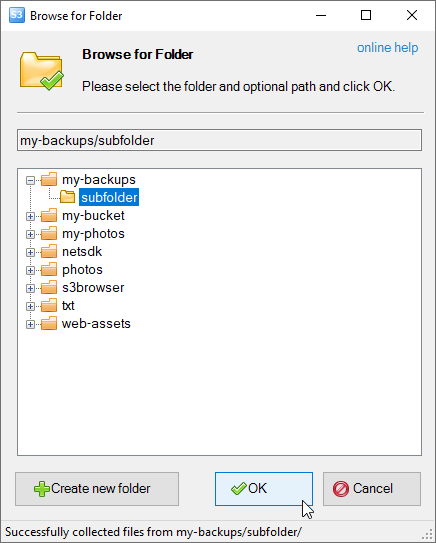 How to share folders on Amazon S3. How to grant access to some folder inside the bucket. With S3 Browser you may also share the folders inside an S3 bucket with ease. 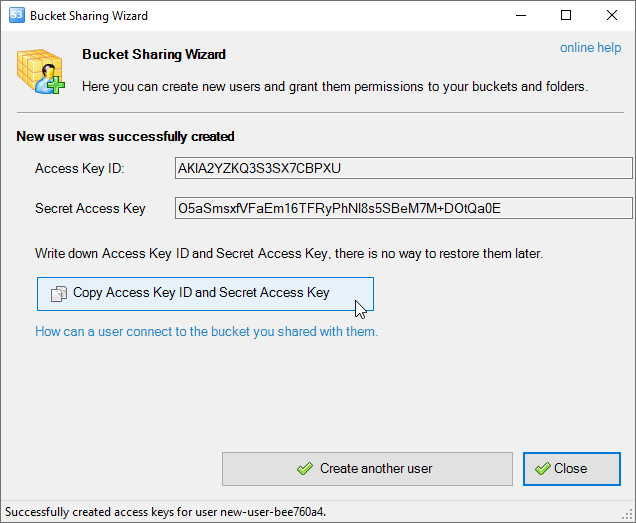 Below we will show you how to grant access to folders inside the bucket and how another user can connect to these folders. 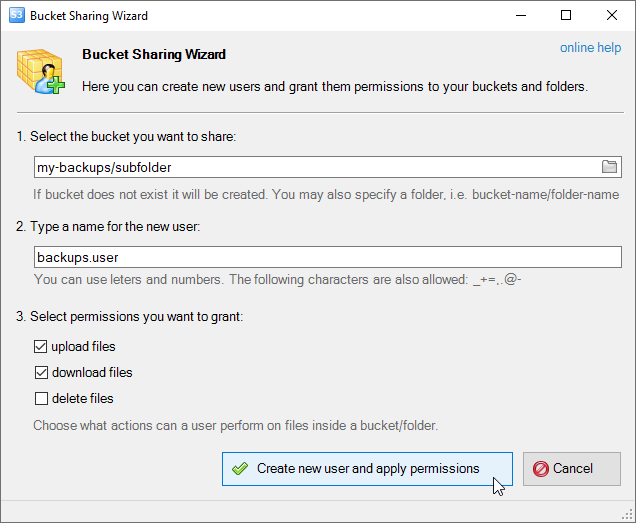 Bucket Sharing Wizard allows you to easily create new users and grant them access to buckets and folders. 2. Choose the bucket you want to share. You may also specify the folder after slash. For example bucket-name/folder-name. Click this button the open Browse For Folder dialog. This dialog allows you to select the bucket and folder. You may also create new folder if necessary. Browse For Folder dialog allows you to select the bucket and folder. You may also create a new folder. 3. Enter the name for new user and choose which actions the user can perform on files inside the bucket/folder. 4. Click Create new user and apply permissions. S3 Browser will create new IAM user and apply all necessary permissions. The following window appears after new user is created. Click the Copy Access Key ID and Secret Access Key button. These credentials required to access the shared bucket and folder. Copy them before closing the window. For security purposes there is no way to restore them later. However you can create new access keys if necessary. 5. Click Copy Access Key ID and Secret Access Key to copy access keys and bucket into the clipboard. Send these details to the user. Below we will describe how can a user connect to the bucket. How to connect to shared bucket. How to use Amazon S3 Bucket/Folder shared by another Amazon S3 user. 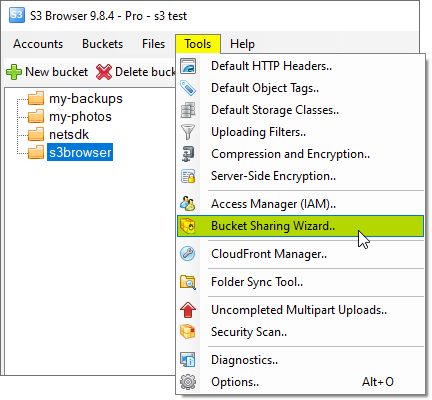 With S3 Browser Freeware you can easily connect to the buckets and folders shared by other Amazon S3 users. If you don't have an AWS Account, the person who want to share the bucket with you, can create an IAM Account for you and provide Access Key ID, Secret Access Key and Bucket/Folder name. Above you may find detailed instructions on how to create new IAM user and share the bucket/folder with them. The next you need to download and install S3 Browser and enter your Access Key ID and Secret Access Key. Enter the bucket name and optional path. 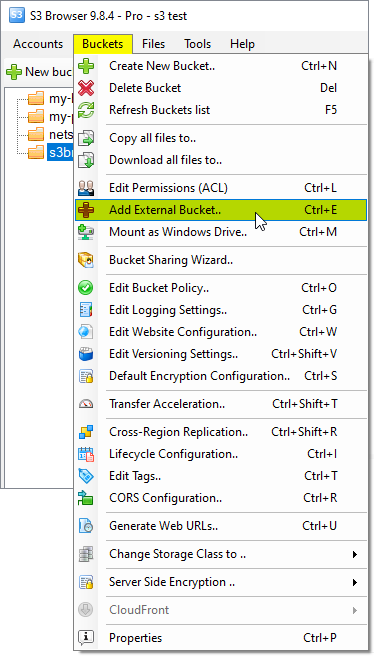 Click Add External Bucket. The external bucket is added. You can now upload, download, copy, move files to and from this bucket.